Ink Long March Project is a continuation of the exhibition held in 2015. a.m. space will be re-examining “ink” in the contemporary context, through conducting a series of exhibitions. In a linear aspect, we will be reviewing the history of ink art development. By conducting open dialogue between artists born in 1970s to 1990s, the project proactively seeks to identify the evolutionary trend in ink. In exploring the horizon of the definition of, and the possibility in ink art, a.m.space selects artworks possess distinct ink features over time, addressing on the breakthrough in traditional boundaries, revealing the essence and spirits of Chinese Painting. As the first exhibition in the project, a.m. space invited artists TSANG Chui Mei and TAO Hoi Chuen to discuss the infusion of Chinese and Western Aesthetics. 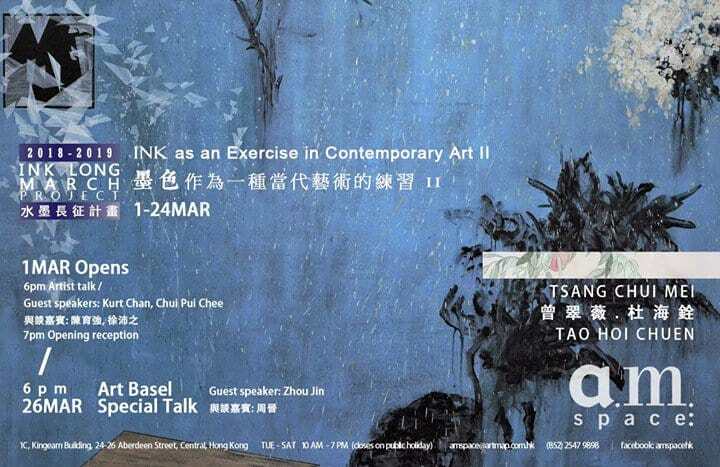 TSANG and TAO make use of acrylic paint and Chinese ink to discuss the sense of contemporary in traditional Ink respectively. TSANG Chui Mei combines Chinese and Western elements to portrait form and sensitivity. Despite the lack of Chinese ink in the artworks, she is able to manipulate motifs in Chinese paintings in response to the abstraction in Chinese paintings. TAO Hoi Chuen carries out his existential explorations with Traditional Gongbi techniques. He inscribes his paintings with philosophical text, creating enchanting intertextuality in a traditional format. The two artists merge Chinese and Western Aesthetics in distinct manners and form discursive comparisons. Born in 1972, Tsang Chui-mei lives and works in Hong Kong. She obtained her Bachelor and Master degree in Fine Arts from the Department of Fine Arts at the Chinese University of Hong Kong in 1996 and 2004 respectively. She was the winner of the Philippe Charriol Foundation 20th Anniversary Competition in 2005 and has had numerous exhibitions in Europe and Asia. Her work is collected by the Hong Kong Museum of Art, and it is in private collections in various parts of the world. Tsang Chui-mei has been selected to participate in the artist-in-residence programme of Cité Internationale des Arts in Paris, France in 2015. Tsang Chui-mei’s work is a space for the mind more than a physical place for holding any real object. It is in a shifting state imbued with the unknown or perhaps merely the nothingness devoid of all things. She prefers lyrical themes. Images are systematized and generalized by observation and transformed in the use of visual elements. From the obvious to the metaphor, some sorts of subjective, inexpressible emotions are inspired. Artworks are being collected by the Hong Kong Museum of Art, Fringe Club, Philippe Charriol Foundation, Hotel ICON, Hotel Stage, Grotto Fine Art Ltd and private collectors. Tao Hoi Chuen, Jacky was born in Hong Kong in 1996. He is currently an Fine Arts undergraduate in The Chinese University of Hong Kong. He has spent his life in Beijing, Taiwan. His artworks are exhibited in Hong Kong and Taiwan. Tao expresses himself through drawing, calligraphy, photography and installation. He is most skilled at traditional Chinese fine-lined painting. His works reflect his contemplation on existentialism and phenomenology. He thinks the structural line and chiaroscuro presented in Chinese fine-lined paintings help to present the essence of objects. He is awarded Wucius Wong New Ink Art Award, Madam Jan Yun-bor Memorial Award for Chinese Painting and Calligraphy and Taiwan Joint Exhibition Excellent Awards.